Hotel Fira Congress (airport), Barcelona. 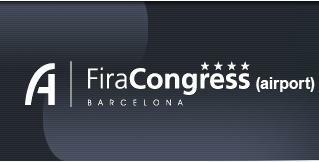 Fira Congress (airport) Hotel Barcelona. The Hotel Fira Congress (airport) is a superior hotel located near the Fira Gran Via 2 exposition centre in Barcelona. Guests of the Hotel are presented with remarkable services and a variety of fantastic facilities such as multipurpose function rooms and state of the art audio-visual equipment. The Hotel Fira Congress (airport) is the perfect location for all of your events. Our large function rooms are naturally lit and can be adapted to meet the needs of any particular occasion. Our professional team of coordinators will be available to assist you in making your function a great success. The Hotel offers 160 modern and comfortable rooms. Designed with the principles of feng shui in mind, the rooms offer a positive and functional atmosphere. All rooms are furnished with contemporary style and include all modern facilities. Guests can enjoy an abundant breakfast buffet every morning in the breakfast room. The Hotel's restaurant prepares tantalizing dishes prepared with the freshest local produce, typical of the Mediterranean region. The cafeteria offers a variety of dishes, served in a contemporary and comfortable environment. With its modern services and impeccable facilities, the Hotel Fira Congress (airport) is ideal for your next function in Barcelona. From the 1st of July 2010 the Hotel Fira Congress (airport) will offer a free shuttle to and from the airport, 7/7, 24 hours a day. This is a service with a limited capacity. The schedule could be afected due to the traffic. The hotel offers a shuttle (max. capacity 12 pax. ), totally free and with every 45 minutes departure from the Hotel. As the service is in both Barcelona’s Airport Terminals, some times the waiting time for the pick up service in the Airport, could be more than expected for the guest. The hotel couldn’t confirm a waiting time exactly and for this reason the hotel won’t be responsible for waiting times superiors at normal time. At the same time, and because this is a added value, with no cost for the guest, and with a limited capacity, it’s important to book the service from the hotel to the Airport one day before, because if the service is full, the hotel won’t be responsible for this. If credit card owner and customer who will stay at hotel do not correspond, the first one have to contact hotel to authorize credit card use as guaranty or payment. Reservations for 5 or more rooms will be consider as a group: special conditions of payment or cancellation can be applied as well as supplement on rate. the external parking of Hotel Fira Congress, will be limited with barriers, therefore will charge an entry of 5 € (VAT included), parking per day, while the interior parking Hotel, will continue having a price of 14 € as stipulated.